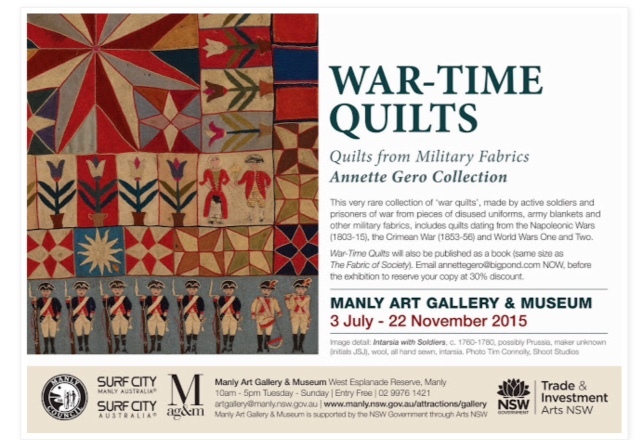 War Quilts Exhibition – Manly Art Gallery from July 3 | Eastwood Patchwork Quilters Inc.
Make Sure that you have time in the 4 months to get to the Manly Art Gallery, West Esplanade Reserve, Manly. the exhibition opens July 3 through to November 22. Open 10am until 5pm, Tuesday to Sunday. Free Entry. This very rare collection of ‘war quilts’, made by active soldiers and prisoners of war from pieces of disused uniforms, army blankets and other military fabrics, includes quilts dating from the Napoleonic Wars (1803-15), the Crimean War (1853-56) and World Wars One and Two. A publication by The Beagle Press accompanies the exhibition.